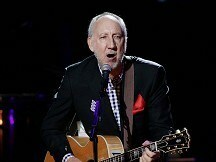 Music legend Pete Townshend has laid into computer giant Apple blasting its music service iTunes as a "digital vampire", as he called for greater support and financial rewards for artists from online firms. In a keynote speech, The Who's guitarist claimed the internet was "destroying copyright", and said writers and musicians should expect to be paid if their work was generating money for others. Townshend also dismissed suggestions that "sharing" music helped to spread the word about artists. The guitarist - delivering the first annual BBC 6 Music John Peel Lecture at the Radio Festival in Salford, Lancashire - said: "The word 'sharing' surely means giving away something you have earned, or made, or paid for?" However he reserved his greatest venom for Apple's online music store iTunes, criticising it for creaming off profit without providing any support mechanisms for music acts. The company is the market leader of around 70 legal download services, accounting for upwards of 75 per cent of all music downloads. It also gives away a track from an emerging artist each week and has hosted a month-long festival each year that has featured 300 artists over the past five years. iTunes did not wish to respond to Townshend's comments. The musician - whose Lifehouse rock-opera predicted a concept similar to the internet 40 years ago - said the public also needed to adjust the way they approached digital music. "It would be better if music lovers treated music like food, and paid for every helping, rather than only when it suited them. Why can't music lovers just pay for music rather than steal it?" he asked the audience of broadcasting executives. Coldplay's comeback saw them shoot to the top of the album charts but fail to break into the top ten singles, despite having two new entries. An album featuring unheard material by Amy Winehouse is to be released just months after the singer's death. A defence witness in the trial of Michael Jackson's doctor has said he believes the singer gave himself a fatal injection of an anaesthetic. Adele is to undergo surgery in a bid to cure the throat problems which have threatened to wreck her voice forever. Lady Gaga has landed in India to perform at a Formula One after-party and wore a giant beehive hairdo modelled on the country's flag. Pink Floyd guitarist David Gilmour's son has lost an appeal against his 16-month sentence for going on a drink and drug-fuelled rampage at a student fees protest. Sinead O'Connor has revealed she is still in touch with some of the friends she made on Twitter, despite quitting the site.